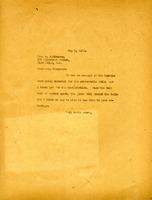 Shaw sends thanks for the candied fruits and calico dolls and encloses a contribution. The delay in writing was caused by the illness of her children, but they are better now and she can catch up on her correspondence. 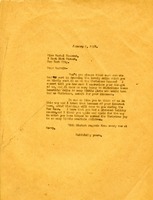 Martha Berry thanks Mrs. A. J. Cleason for "barrels containing material for the unbreakable dolls." Emma Gleason sends seven barrels of materials for dolls that are almost complete except the wigs need to be glued on. She offers to pay for any extra charges and asks to be informed how the dolls are used. 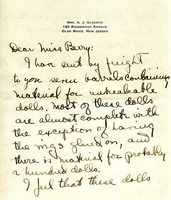 Minerva L. Jerkens writes to complain that she had not received acknowledgement for a box of rag dolls sent the previous November and asks for immediate attention to the matter. 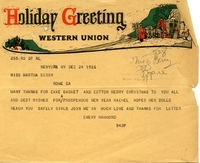 Letter to Rachel Hammond from Martha Berry thanking her for the donation of dolls that she sent to the schools for Christmas. 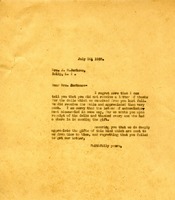 Miss Berry expresses her appreciation for Miss Hammond's sentiment and informs her that without her donation the little girls at the school would have no Christmas. Miss Berry also wishes her a happy new year and hopes for a good holiday season. Emily Hammond thanks Martha Berry for sending cake and cotton, and wishes everyone a prosperous year. Hammond's first name is erroneously given as "Emery".